This month's column skips the dreaded sequel for last month's (not much to columnize about me liking Jurassic World, other than summing up lots of hyperboles and superlatives, which makes for a dull read) and instead targets another very predictable topic, that jolly show called Game of Thrones, which had yet again drawn to a season close. We've arrived at that time in the series we knew would come sooner rather than later. Book readers no longer can say with certainty what's to come for the majority of story lines. The series has caught up with the various narratives in the novels in most cases and has even well progressed beyond them in some. Not to mention many of them have also been changed to such an extent they little resemble their literary counterparts. Only a few of the characters' stories are still behind, and a bunch of them involve people we haven't even met yet, and may not ever meet on the show. So what does that mean for the relationship between those who have read all the novels, and those who solely stick to the series? For one thing, the latter party doesn't need to worry so strongly about dodging spoilers, which also means the former can once more open their mouths in public without fear of someone socking a fist in them. It makes for a better balance between both types of fans, now that they all know who, when and what we're talking about and nobody knows for a certainty what's going to happen next (except for Mr. Martin, I should hope). The interchange of theories will now evolve along more equal lines, since both parties know as much, or more aptly speaking, as little. Of course, book readers still know about the other possibilities certain characters could have had, as they had them in the book, and may take a hint or two from those, though there are no longer any guarantees. 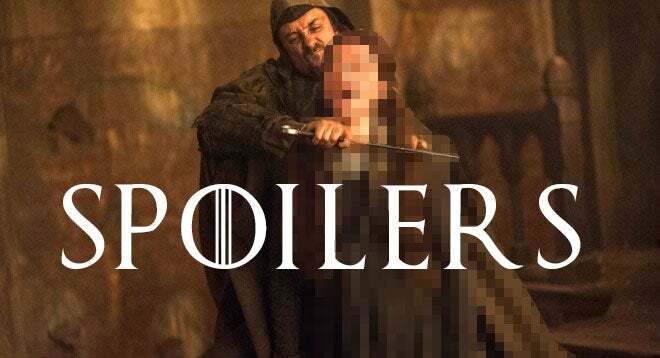 The only spoiler threat left for avid viewers/non readers now involves the new characters, like the already announced Randyll Tarly, Septon Meribald and Euron Greyjoy. However, of these characters the only one whose story line from the novel is left mostly intact is that last name. The other two in the books already appeared much earlier in situations the show can't duplicate anymore, because the narrative of the characters they supported has moved well beyond their original point, requiring novel settings for their appearance, which means there's little tangible left to spoil about them. So even though book readers may know their Randyll Tarly, Septon Meribald and Euron Greyjoy from the book, they won't know the new incarnations of these characters and as such anything they think they can spoil about them needs to be taken with a grain of salt (or in Greyjoy's case, salt wives). Book readers and viewers no long need to be at odds, nor do they need to avoid one another socially. Instead, they can embrace in the shared knowledge that nobody knows what's coming any more on their beloved show. So let's go out and celebrate that new equality which formerly could be called adversity. Anyone feel like hosting a lavish feast in some great Lord's hall with lots of wine and song? If not, you've certainly learned your lessons from watching this show.